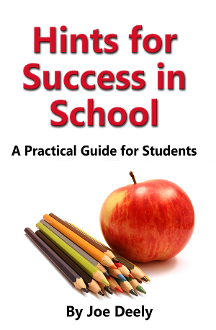 • Provides practical hints teachers can use to help their students. • Great quotes from interesting people. • “Try this” suggestions to put hints into practice. • Inspirational for grade improvements. • Provides skills that students can immediately apply. • Easy to understand with examples of success. Joe Deely graduated with a Masters in Education degree from James Madison University in 1995 and started teaching that fall. He has taught students in grades 6 through 12 his entire 23-year career in public schools. As an alternative education teacher, he finds that his students often struggle with academic, social, and emotional difficulties. His specialty is teaching kids who have a hard time understanding what to do to be successful at school.